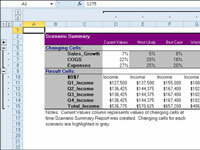 After using Scenario Manager to add scenarios to a table in a worksheet, you can have Excel 2010 produce a summary report. 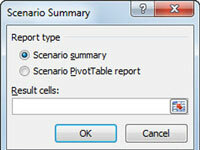 This report displays not only the changing and resulting values for all the scenarios you’ve defined but also the current values in the changing cells in the worksheet table at the time you generate the report. 1Open the workbook containing the scenarios you want to summarize. If you haven’t yet created any scenarios, click the Add button to add the scenarios before you continue with the remaining steps. 2On the Data tab, choose What-If Analysis→Scenario Manager in the Data Tools group. 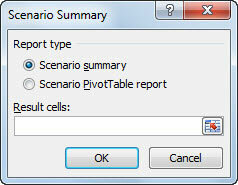 The Scenario Summary dialog box gives you a choice between creating a (static) Scenario Summary (the default) and a (dynamic) Scenario PivotTable Report. You can also modify the range of cells in the table that are included in the Results Cells section of the summary report by adjusting the cell range in the Result Cells text box. 4Click OK to generate the report. Excel creates the summary report for the changing values in all the scenarios (and the current worksheet) along with the calculated values in the Results Cells on a new worksheet.